(Nanowerk News) Astronomers want to record an image of the heart of our galaxy for the first time: a global collaboration of radio dishes is to take a detailed look at the black hole which is assumed to be located there. This Event Horizon Telescope links observatories all over the world to form a huge telescope, from Europe via Chile and Hawaii right down to the South Pole. IRAM’s 30-metre telescope, an installation co-financed by the Max Planck Society, is the only station in Europe to be participating in the observation campaign. The Max Planck Institute for Radio Astronomy is also involved with the measurements, which are to run from 4 to 14 April initially. At the end of the 18th century, the naturalists John Mitchell and Pierre Simon de Laplace were already speculating about “dark stars” whose gravity is so strong that light cannot escape from them. The ideas of the two researchers still lay within the bounds of Newtonian gravitational theory and the corpuscular theory of light. At the beginning of the 20th century, Albert Einstein revolutionized our understanding of gravitation - and thus of matter, space and time - with his General Theory of Relativity. And Einstein also described the concept of black holes. These objects have such a large, extremely compacted mass that even light cannot escape from them. They therefore remain black – and it is impossible to observe them directly. Researchers have nevertheless proven the existence of these gravitational traps indirectly: by measuring gravitational waves from colliding black holes or by detecting the strong gravitational force they exert on their cosmic neighbourhood, for example. This force is the reason why stars moving at great speed orbit an invisible gravitational centre, as happens at the heart of our galaxy, for example. It is also possible to observe a black hole directly, however. Scientists call the boundary around this exotic object, beyond which light and matter are inescapably sucked in, the event horizon. At the very moment when the matter passes this boundary, the theory states it emits intense radiation, a kind of “death cry” and thus a last record of its existence. This radiation can be registered as radio waves in the millimetre range, among others. Consequently, it should be possible to image the event horizon of a black hole. 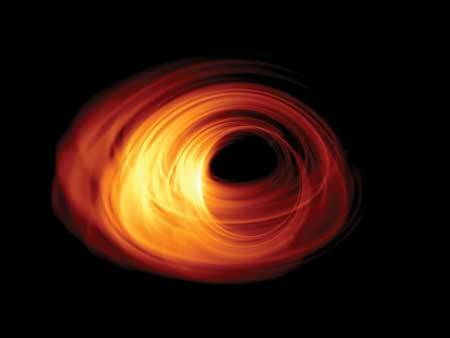 The Event Horizon Telescope (EHT) is aiming to do precisely this. One main goal of the project is the black hole at the centre of our Milky Way, which is around 26,000 light years away from Earth and has a mass roughly equivalent to 4.5 million solar masses. Since it is so far away, the object appears at an extremely small angle. The EHT project exploits this observational technique and in April it is to carry out observations at a frequency of 230 gigahertz, corresponding to a wavelength of 1.3 millimetres, in interferometry mode. The maximum angular resolution of this global radio telescope is around 26 micro-arcseconds. This corresponds to the size of a golf ball on the Moon or the breadth of a human hair as seen from a distance of 500 kilometres! These measurements at the limit of what is observable are only possible under optimum conditions, i.e. at dry, high altitudes. These are offered by the IRAM observatory, partially financed by the Max Planck Society, with its 30-metre antenna on Pico Veleta, a 2800-metre-high peak in Spain’s Sierra Nevada. Its sensitivity is surpassed only by the Atacama Large Millimeter Array (ALMA), which consists of 64 individual telescopes and looks into space from the Chajnantor plateau at an altitude of 5000 metres in the Chilean Andes. The plateau is also home to the antenna known as APEX, which is similarly part of the EHT project and is managed by the Max Planck Institute for Radio Astronomy. The Max Planck Institute in Bonn is furthermore involved with the data processing for the Event Horizon Telescope. The researchers use two supercomputers (correlators) for this; one is located in Bonn, the other at the Haystack Observatory in Massachusetts in the USA. The intention is for the computers to not only evaluate data from the galactic black hole. During the observation campaign from 4 to 14 April, the astronomers want to take a close look at at least five further objects: the M 87, Centaurus A and NGC 1052 galaxies as well as the quasars known as OJ 287 and 3C279. From 2018 onwards, a further observatory will join the EHT project: NOEMA, the second IRAM observatory on the Plateau de Bure in the French Alps. With its ten high-sensitivity antennas, NOEMA will be the most powerful telescope of the collaboration in the northern hemisphere.